Lactose Free & Dairy Free GO Veggie! Do you have allergies or a lactose intolerance and MISS CHEESE???? Then let me recommend GO Veggie!® Lactose Free and Dairy Free cheese which allows everyone to revel in cheesy deliciousness! And with 40 plus products in the US and Canada in a variety of mouthwatering flavors, there’s nothing standing in the way of cheese lovers and the cheesy bliss they deserve. They deliver the blissfully cheesy experience cheese-lovers crave. 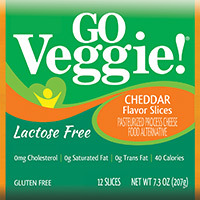 GO Veggie!® is the cheesiest cheese-free experience around. These products stretch, melt and savor like cheese. And they've been winning awards for their proprietary taste and texture since they began back in the eighties. Sometimes the things you love are the things you fret about most. 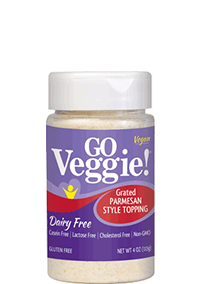 GO Veggie!® Dairy Free products are vegan and casein-free with tons of flavor. So no matter what your reason for avoiding dairy may be, you can enjoy delicious cheesy bliss without cheating on your values. 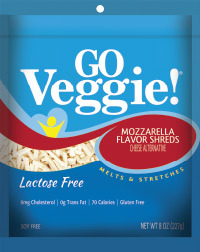 Available in slices, shreds, grated toppings and cream cheese in a variety flavors, find more information at www.goveggiefoods.com/vegan. I substituted GO Veggie! products in many of recipes in place of when I would use regular cheese and no one in my family noticed it! There was no change in texture or taste and it melted just like regular cheese! I must say I was impressed! You can purchase GO Veggie! products from your local retail store.